Pick of the bunch with Distos? I bought a Leica D2 a couple of weeks ago to replace my Bosch PLR 30, to be fair, its amazing. Its no good outdoors in bright sunlight but its incredibly quick and saves a poop load of time grabbing those few nervous last minute readings. It reads in Feet and Inches and can memorise up to ten measurements (which is cool since I don't have to mark the disks or barrel every time I take a measurement). Satsuki, not sure about the A5 but on the D2 you hold the unit button and the negative button simultaneously to turn the beep on and off. The settings stick when its turned on and off. My only complaint is that the D2 measures from the back of the device by default. The D2 is the cheapest in the D range and it replaces the A2 which is still popular as a budget device. You'll probably have to buy gear rings for your lenses if they don't fit. How to keep an object center frame? Thanks for posting Scott, guess I'll just have to secure it then. I hope magic arms are up to the task, I can't really afford to have any play in the grip but I can't think of any other modular articulated grips that are light enough to fit to a camera. Any ideas? Disto, leatherman, chinagraph and lens tissues are all I carry on me. I'll put anything else I need in a ditty bag fitted to whatever grip we're using. A pouch is almost always a practical thing to wear when using a dolly or steadicam, nothing worse than having to sprint to your bag to get something as trivial as a whip. Does anyone here carry less? My tutor at college was an AC for in excess of twenty years and all he carried was a Kelly calc and a pen!! Go to Arri or Panavision and ask crew support if you can practice with a camera. Its that easy. You'll probably meet people there who are regularly in work so it may even lead to a gig if you're lucky. 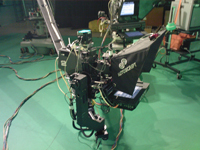 Something like an egripment classic jib arm won't cost any more than $70 (US) for a days hire. I'm not saying its out of the realm of possibility but I can't think of any other way to create a crane like (smooth) ascent. If you don't mind the noise you could bump up the gain, reducing the detail level might soften some of the harshest fuzz. Unfortunately it is a slow system so it will require more light. What was the problem anyway, did you not like the look of the image produced by the camera or are you having difficulty lighting the scene? The end of film for TV production? Again, not wanting to challenge your opinion as you are well entitled to it but I think that your claim is fairly unsubstantiated (scientifically) unless you can provide a link or reference. http://www.arri.de/fileadmin/media/arri.co...ogyBrochure.pdf is one of the only reputable papers I have read on the subject and whilst the author did not take variables such as poor focus into account there is no suggestion that that a film prints perceived resolution can dip as low as 1280x720 from either a 2k or 4k scan. In fact the author suggests that the majority of the audience in the theatre are capable of perceiving as much as 4Ks worth of resolution. Taking variables such as soft focus, poor printing etc into account it is conceivable that the perceived resolution would fall to around 1920x1080 on a 2K print but it would be hard to imagine the same of a 4K film out. Trying to compare the look of a film print to a highly compressed digital copy projected on an LCD TV is kind of a useless endeavour. Blow that image up on to a standard 20m wide silver screen and then tell me how it looks! ;) Anyway, we sound like a bunch of photography nuts banging on about the benefits of increased resolution (megapixel war!). The fact remains that digital and film are two different formats. For the moment, I think film still looks better , but digital definitely has it benefits and may well suit a project aesthetically. Blanket statements which dismiss the merits of either format aren't conducive to intelligent debate. Extract from http://www.arri.de/fileadmin/media/arri.co...ogyBrochure.pdf Pg. 7 "This test is admittedly an ideal case, but the ideal is the goal when testing the limits of image storage in film. In the test, the smallest resolvable detail is 0.006 mm large on the fi lm, whether 35 mm or 16 mm. Thus, across the full fi lm width there are 24.576 mm / 0.006 = 4096 details or points for 35 mm film and 12.35 mm / 0.006 = 2048 points for 16 mm film. These are referred to as points and not pixels because we are still operating in the analog world. These statements depend upon the following: (1) looking at the center of the image (2) the film sensitivity is not over 250 ASA (3) exposure and development are correct (4) focus is correct (5) lens and film don’t move against one another during exposure (6) speed <50 frames/sec" There you have it kids, I'd trust the judgement of an Arri Engineer any day over that of the BBC (although it could be argued that Arri have a vested interest in the continued use of 16mm film). Either way, the above statement suggests that a 2K resolution can be acquired from super 16mm negative when the above criteria are met. Considering that Vision 3 features a similar grain structure to older 250ISO stocks, suggests that even faster stocks should theoretically have similar image resolving capabilities. Despite all of my ranting and the best efforts of Arri, the BBC do not accept footage originating on 16mm for HD. For the moment, unless the production calls for a theatrical release I'm sticking to SD for 16mm. Yes it looks better in HD but also costs a lot more and its rare that any one will see it in full HD. I'll try to find the paper Freya although I read it as a hard copy. Arri have also released a document but I'm having trouble tracking it down. It was in relation to DI for 16mm. I don't agree with the beeb on this one at all. There is definitely at least 1080 res that can be squeezed out a neg even on the newer vision 3 500T stock. If not then there is still an appreciable difference between an SD and HD telecine/scan. Technicolour can digitise 16mm to cineon or mxf files direct to hard disk drives at HD resolution. Effectively they telecine the negative and print to HDCAM-SR and then digitise the material to HDD. Upside is you will have a HDCAM-SR master and a HDD with your finished product ready to conform. Unfortunately you will have to pay for the digitization but its not much. The only alternative is to hire a deck and digitize it yourself but beware that full res 4:4:4 HQ HDCAM-SR weighs about 880mbps which can make online editing problematic if you don't have a high spec rig. I'd suggest transferring to HDCAM and digitizing it yourself, tests conducted by the BBC suggest that there is little benefit in squeezing full 1920x1080 res out of a 16mm negative below 160 ISO. Actually the BBC won't show any footage that originated on 16mm on their HD channels as they don't believe it to be of a high enough resolution regardless of the print format. HDCAM is fine particularly if your grade is happening during the telecine. HDCAM-SR is better but so is 35mm compared to 16mm, if you can't afford it settle for the most practical option.